The most comfortable winter boots are those that are light, waterproof and most importantly warm. Since a good quality winter design can cost well over $100, you also want something that is going to be durable, and that won’t fall apart on you after a couple of seasons. Obviously in the colder months a significant aspect of being comfortable being warm and feeling that you look good, so we have found styles that are not only super warm but stylish as well. When shopping for the best winter boots, it is also essential to make sure you can walk comfortably in them and that they have a good tread so that you won’t slip in icy conditions. 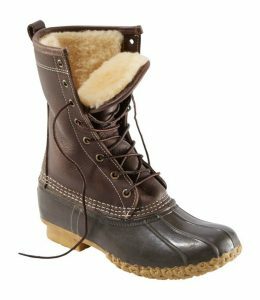 One of the best all-around winter styles, especially for wet, slushy conditions, are the Shearling Lined Bean Boots from LL Bean. They are tough, quite warm and they look great. They are a tad pricey, but you will have these for years, and they won’t wear out. If you are interested in this design, the shearling only goes to the part where the rubber begins (although you can get shearling insoles), so you will still have to wear reasonably warm socks with this style probably. The Bean designs are made with a full-grain leather that can withstand rain and snow, so they are pretty resilient to all kinds of weather. They also feature the L.L Bean rubber chain-tread bottom and a footbed that is lined with a 200-gram Thinsulate™ Insulation, so they should be okay on slippery, cold surfaces and you shouldn’t feel the cold coming up from the bottom of the sole. This design comes in 8″, 10″ or 16″ length and you can roll the upper portion down and tie them so they fold over. These are a very warm and popular option that will help you look forward to going out in the cold. If you want a really warm, well-made winter design, you are going to want to look at some of the Canadian brands that are doing great things with winter styles. This list is relatively heavy on brands from Canada since they have been turning out a lot of high-quality winter wear lately that will keep you comfortable and warm. 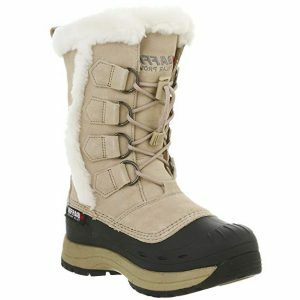 First up is Baffin, they have many good designs, with one of their most famous being the Chloe Insulated Boot. It is pretty sturdy winter footwear that you will want to take a look at if you need a design that is super warm, since it is good to minus -40ºC/-40ºF. For such heavy-duty winter footwear, this style is surprisingly lightweight and easy to move in. The Chloe is made from high quality 100% leather with faux fur trim, and it comes in a few different color options. Overall these are a great option if you are looking for warm, well-made winter styles, especially for harsher conditions. Kodiak is a brand that is also from Canada and that have a great selection of winter boots in all kinds of styles. The Kodiak brand is known for making footwear that is comfortable and can deal with snow, ice, sleet, rain, and salt and still look great. If you are looking for an alternative to the duck style, the Kodiak Alcona is a bit of an unexpected moto-inspired design for winter. It has a soft microfiber lining and is waterproof, so your feet will stay warm and dry. It features a full-length side zipper which helps make the Alcona easy to get on and off. It also has some pretty serious tread on the bottom to help stop you sliding around in slippery conditions. The Alcona design is comfortable, warm and functional, and a little different than what everyone else is wearing. 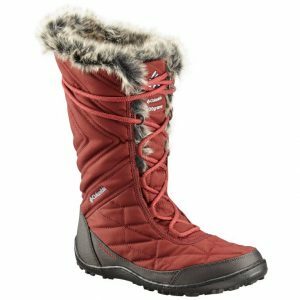 Kamik has a lot of duck type styles that are very popular these days that hold up well for extreme winter conditions, definitely check out their Momentum Snow Boot that women seem to love. Another solid option that can blend in with most office type work clothes is the Kamik Boston Snow Boot. It is a good city walking design for cold weather since they are warm and waterproof, so they will keep your feet dry and warm. The Boston is reasonably light making them easy to walk in, but not so lightweight that they don’t have any traction. They aren’t as bulky as some of the other options on this list and the design looks great in person. The construction on the Boston is also excellent so that they will last for quite a long time. Did I mention Kamik are from (can you guess?) Canada. 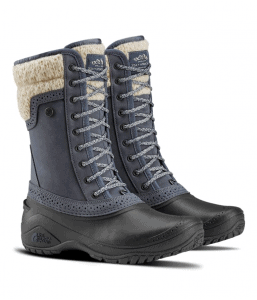 Shellista by The North Face is often recommended as one of the best winter boots for women due to their ability to keep your feet warm and dry in harsh conditions. They have all of the features that you need in a fantastic winter style. They are comfortable, warm, light and they have a great tread. They come with a lifetime warranty, so if anything goes wrong, you can get it fixed for free. Pictured above is the mid length, but you can get a taller version as well. The one downside to this style is that while the upper calf area is nice and warm, the toe area can get cold if you are standing on snow. La Canadienne is a brand out of Montreal, where they are used to dealing with some pretty harsh winter conditions. The boots that La Canadienne make are known for being able to withstand the elements, while also being pretty stylish and fashion forward. They are reasonably expensive, but they are made using top-notch Italian materials, are weatherproof, and are built to last. The La Canadienne Evitta not only looks fantastic but is also super warm. It is lined with a soft, warm exposed microfiber lining that covers the entire interior of the design, so it is quite cozy and warm. The sole is a super durable rubber sole that is made to grip icy, wet or snowy conditions. 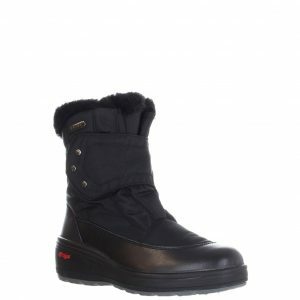 A budget-friendly option that is worth checking out is the Kingshow Women’s Globalwin Waterproof Winter Boots. They are extremely popular and well reviewed on Amazon with women loving this style for keeping their feet warm and dry. They are also cute and very reasonably priced. Reviews report that this design has a nice comfortable felt lining, a good grip, and the footbed has a soft cushion to it. Blondo is another one of the many Canadian brands that are putting out great winter footwear. What makes Blondo’s footwear especially noteworthy, is that most of their fashionable styles come in waterproof leather. 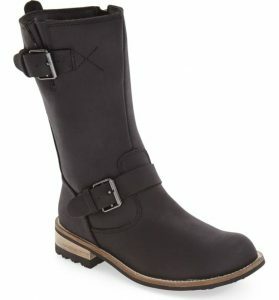 If you need a stylish dress design that you can wear to work in all kinds of weather, you should check out some of their waterproof leather tall boots. They have a few options that are specifically for cold weather, one that is super warm, light and looks great is the Blondo Glade. It will be a comfy option for city walking or commuting if you don’t need a dressy design. The Glade is made with a waterproof suede, and the seams are protected with Aquaprotect®, so they stay nice and dry. The footbed is cushioned for comfort, the outsole is rubber, and they aren’t clunky at all, so they are easy to drive (or walk) in. If you don’t mind spending a bit of money, a popular luxury style is the Lacy Rabbit Fur Combat Boots from Aquatalia. They are very expensive, but the Aquatalia designs are very much-loved by the people who are lucky enough to own this brand. They are lace-up, which is nice to help get a comfy fit. They are also shearling lined with the rabbit fur at the top, so they are going to be nice and warm. Another Canadian brand that is worth taking a look at that are super warm, but a little bit different from your standard duck styles is Pajar. They offer all kinds of styles from sporty to heritage, with one of their most famous being the Samar. It is a great option that will keep you super warm (temperature rated to -22°F/-30°C). The Samar is also water-resistant and is nice and light, so you can easily walk or drive in them without feeling like they are too bulky. 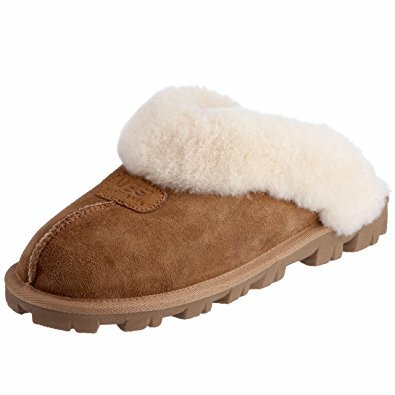 The inside is lined with a fuzzy fleece, and it has an insole that uses a wool blend top cover that is great if your feet tend to sweat. The outsole is made to grip well in challenging winter conditions. 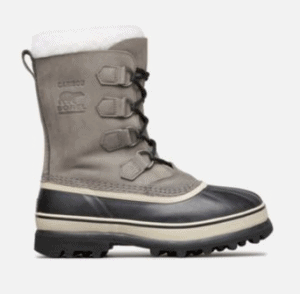 Sorel (founded in Canada) is the go-to boot for a lot of people. They are designed well, will keep your feet warm and dry, and they look great. 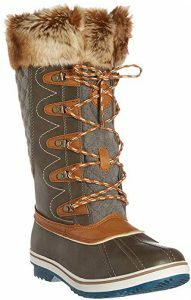 The two most popular Sorel options for women are the Caribous or Joan of Arctic. You can find these styles everywhere in all kinds of color options. If you have bought Sorels in the past, you should be aware the that Sorel’s reputation for durability and quality has kind of gone downhill in the last few years since they started to be made in China. Before moving production to China, most Sorel designs were almost indestructible. Regardless, a lot of people still love Sorel and their warmth and style. If you are doing a lot of walking, the Caribous and Joan of Arctic designs probably aren’t the best option for you as they are quite heavy to walk in although they do work very well in deep snow at keeping your feet warm and dry. UGGs offer many winter options. The most popular UGG winter boot is the Adirondack, which is an excellent style for harsh winter conditions. 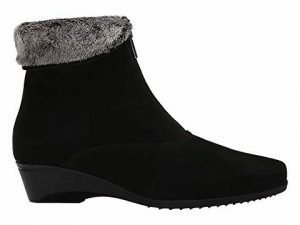 Another Ugg option worth considering, especially if you are looking for a nice dressy design for parties or work is the Dawna. 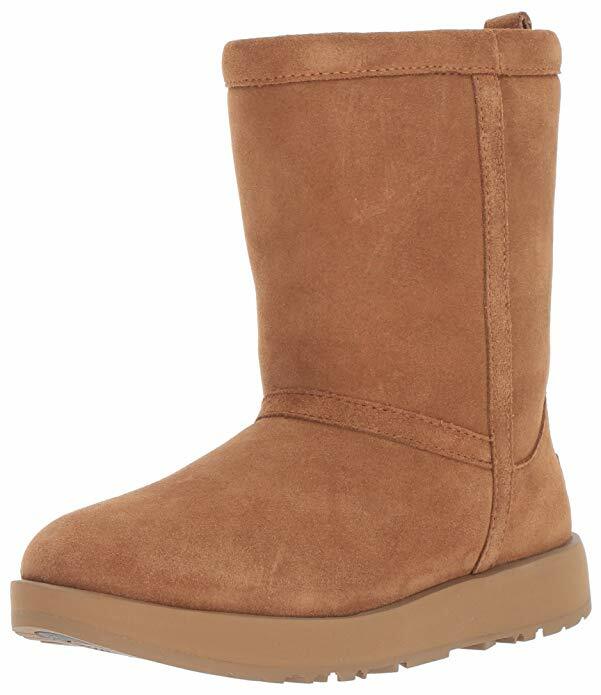 It is a waterproof suede wedge that has the UGGpure lining, so they are super warm and cozy. The other great thing about the Dawna is the sole is made from rubber and has the UGG ArcticGrip, which should give you excellent traction in wet and icy conditions. 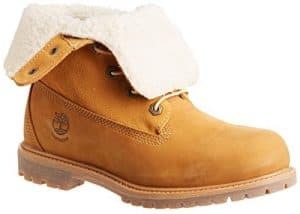 Timberland has a number of nice looking, shearling lined winter boots that are perfect for city walking in all kinds of conditions. They are great because they look good, can go with most casual outfits, and they have quite good traction for slippery conditions. 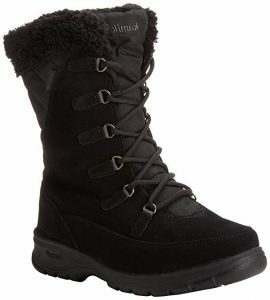 They are also waterproof and insulated with fleece, and you can wear these Timberlands laced up or folded down. Since they are lace-ups, you can adjust them to accommodate thick socks if needed. The only downside to this style is that they are pretty heavy, so if you walk long distances in the winter, they probably aren’t the best option. Colombia has a number of options for great winter styles with one of the warmest and the lightest being the Columbia Women’s Minx Mid III. It has the Colombia Omni-heat feature which is those little silver dots that reflect your body heat back to you. They are very warm (good to -25 degrees F), flexible, waterproof and have excellent traction. They are also known for being very comfortable due to the cushioned insole. The Minx is light enough to drive in and easy to walk in. 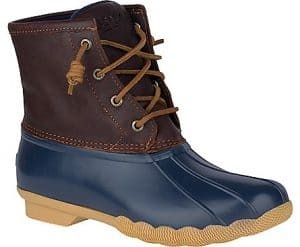 Our final option is the Women’s Saltwater Duck Boot with Thinsulate by Sperry. 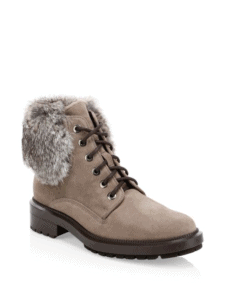 These are a slightly different style that uses Thinsulate rather than shearling to keep your feet dry and warm. They are good for walking around since they are relatively lightweight and are one of the least bulky of the duck styles. Most people can wear this design comfortably for driving. Since they are relatively low, they wouldn’t be the best option for deep snow or extreme conditions, but they will work well for rain and light snow. Weight/Walking- – The warmest designs are often those that are the heaviest and most clunky to walk in. If you are planning on doing a lot of walking, it is essential that you check the weight of the boot. Sorels tend to have this problem, they look great and are super warm, but are difficult to walk long distances in especially if you are facing hills or stairs on your walk. Durability– Many winter styles cost well over $150, which is a significant amount of money. If you are spending a lot, you will want to get a lot of wear out of them, so pay particular attention to reviews and look for how many seasons women can get out of the various brands. Lace-up– Lace-up styles can give you a little bit more of a custom fit. On cold days if you need to wear thicker socks or multiple layers of socks, you can make the laces a little bit looser. The downside to getting a lace-up is that if you go for a taller option, it can be a little bit harder to get on and off. Waterproof -Choosing a waterproof option is a critical feature that you need to look for if you want your feet to stay dry and warm. Find styles and brands that specifically say that they are waterproof or weatherproof. For elegant designs try La Canadienne, Blondo, or Aquatalia. Length – Winter boots come in all different lengths. Most women aren’t going to need long lace-up styles unless they are walking in deep snow regularly. If you are doing a lot of walking, you may want to look for mid-calf length of lower just to cut down on the weight or bulk of a particular design. Traction– One of the most essential features of a great winter design is whether it has good traction. Some of the dressier styles don’t have any traction at all so are best avoided in winter conditions. Look for designs that have a good rubber sole with a secure grip.